Uridine is a glycosylated pyrimidine-analog containing uracil attached to a ribose ring (or more specifically, a ribofuranose) via a β-N1-glycosidic bond. It is one of the five standard nucleosides which make up nucleic acids, the others being adenosine, thymidine, cytidine and guanosine. The five nucleosides are commonly abbreviated to their one-letter codes U, A, T, C and G respectively. However, thymidine is more commonly written as 'dT' ('d' represents 'deoxy') as it contains a 2'-deoxyribofuranose moiety rather than the ribofuranose ring found in uridine. This is because thymidine is found in deoxyribonucleic acid (DNA) and not ribonucleic acid (RNA). 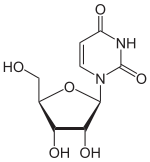 Conversely, uridine is found in RNA and not DNA. The remaining three nucleosides may be found in both RNA and DNA. In RNA, they would be represented as A, C and G whereas in DNA they would be represented as dA, dC and dG. Some foods that contain uridine in the form of RNA are listed below. Although claimed that virtually none of the uridine in this form is bioavailable "since - as shown by Handschumacher's Laboratory at Yale School of Medicine in 1981 - it is destroyed in the liver and gastrointestinal tract, and no food, when consumed, has ever been reliably shown to elevate blood uridine levels', this is contradicted by Yamamoto et al., plasma uridine levels rose 3.5 fold 30 minutes after beer ingestion, suggesting, at the very least, conflicting data. On the other hand, ethanol on its own (which is present in beer) increases uridine levels, which may explain the raise of uridine levels in the study by Yamamoto et al. In infants consuming mother's milk or commercial infant formulas, uridine is present as its monophosphate, UMP, and this source of uridine is indeed bioavailable and enters the blood. Consumption of RNA-rich foods may lead to high levels of purines (adenosine and guanosine) in blood. High levels of purines are known to increase uric acid production and may aggravate or lead to conditions such as gout. Moderate consumption of yeast, about 5 grams per day, should provide adequate uridine for improved health with minimal side effects. Note: It has been suggested that the RNA content of yeast products should be chemically reduced if these products are to be consumed in high amounts (50 grams or more per day) as a source of protein. However, such processing is expensive and, as of 2008, commonly available brewer's yeast products were not RNA-reduced. Harvard researchers report that omega-3 fatty acids and uridine, two substances in foods such as fish, walnuts, molasses, and sugar beets, prevented depression in rats as effectively as antidepressant drugs. “Giving rats a combination of uridine and omega-3 fatty acids produced immediate effects that were indistinguishable from those caused by giving the rats standard antidepressant medications,” said lead author of the study William Carlezon, director of McLean’s Behavioral Genetics Laboratory. Uridine plays a role in the glycolysis pathway of galactose. There is no catabolic process to metabolize galactose. Therefore, galactose is converted to glucose and metabolized in the common glucose pathway. Once the incoming galactose has been converted into galactose 1-phosphate (Gal-1-P), it is involved in a reaction with UDP-glucose, a glucose molecule bonded to uridine diphosphate (UDP). This process is catalyzed by the enzyme galactose-1-phosphate uridyl transferase and transfers the UDP to the galactose molecule. The end result is UDP-galactose and glucose-1-phosphate. This process is continued to allow the proper glycolysis of galactose. ↑ Gasser T, Moyer JD, Handschumacher RE (1981). "Novel single-pass exchange of circulating uridine in rat liver". Science. 213 (4509): 777–8. doi:10.1126/science.7256279. PMID 7256279. ↑ Yamamoto T, Moriwaki Y, Takahashi S, Tsutsumi Z, Ka T, Fukuchi M, Hada T (2002). "Effect of beer on the plasma concentrations of uridine and purine bases". Metabolism: Clinical and Experimental. 51 (10): 1317–23. doi:10.1053/meta.2002.34041. PMID 12370853. ↑ Yamamoto T, Moriwaki Y, Takahashi S, Yamakita J, Tsutsumi Z, Ohata H, Hiroishi K, Nakano T, Higashino K (1997). "Effect of ethanol and fructose on plasma uridine and purine bases". Metabolism: Clinical and Experimental. 46 (5): 544–7. doi:10.1016/s0026-0495(97)90192-x. PMID 9160822. ↑ Carver JD (2003). "Advances in nutritional modifications of infant formulas". The American Journal of Clinical Nutrition. 77 (6): 1550S–1554S. PMID 12812153. 1 2 3 Jonas DA, Elmadfa I, Engel KH, Heller KJ, Kozianowski G, König A, Müller D, Narbonne JF, Wackernagel W, Kleiner J (2001). "Safety considerations of DNA in food". Ann Nutr Metab. 45 (6): 235–54. doi:10.1159/000046734. PMID 11786646. ↑ Storck R (1965). "Nucleotide composition of nucleic acids of fungi. I. Ribonucleic acids". Journal of Bacteriology. 90 (5): 1260–4. PMC 315810 . PMID 5848326. ↑ Yamamoto T, Moriwaki Y, Takahashi S, Tsutsumi Z, Ka T, Fukuchi M, Hada T (October 2002). "Effect of beer on the plasma concentrations of uridine and purine bases". Metab Clin Exp. 51 (10): 1317–23. doi:10.1053/meta.2002.34041. PMID 12370853. ↑ Carlezon WA, Mague SD, Parow AM, Stoll AL, Cohen BM, Renshaw PF (February 2005). "Antidepressant-like effects of uridine and omega-3 fatty acids are potentiated by combined treatment in rats". Biol Psychiatry. 57 (4): 343–50. doi:10.1016/j.biopsych.2004.11.038. PMID 15705349. ↑ Stryer, Berg and Tymoczko (2002). "Section 16.1 Glycolysis Is an Energy-Conversion Pathway in Many Organisms". Biochemistry (5th ed.). New York: W H Freeman.